An unplanned stop to check out a monastery. Finally, after all the preparations–deciding on our Italy bike tour in Puglia, electing a self-guided tour, opting for electric-assist bikes, and planning a longer trip in Italy and Russia–we were on our bikes and pedaling across the countryside outside Matera in Italy’s southern Italy province of Basilicata. Our cycling in Italy, counting a warm-up ride, covered seven days. During that time we slept in seven different towns and managed to average 55 kilometers (35 miles) a day, for a total of over 350K, or 200-plus miles. Our route took us from Matera in the arch of the boot, east and south looping down and cross the Salento Peninsula (the heel of Italy’s boot) and back north to Lecce. 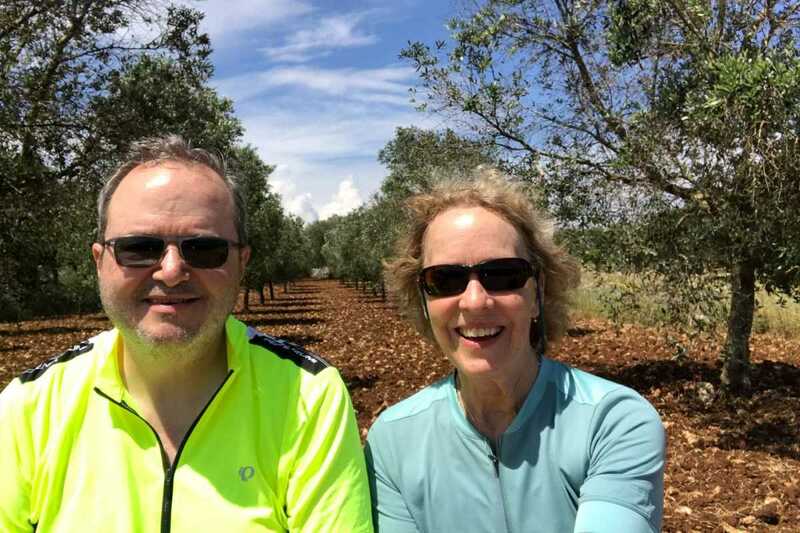 We visited both the Ionian and Adriatic Seas, and were introduced to Puglia (or Apulia in English,) this distinct and lovely part of Italy we came to love. The ride itself is what we’re asked about most. While we’ve become fans of biking over the past couple years, we’re by no means experts. We bought ourselves bikes again a couple years ago when we purchased a small condo in Saint Paul to use when visiting our Minneapolis family. We tried an easy European cycling tour a year ago. But for the most part, our preparation was wishful thinking and keeping our fingers crossed. So, how did it go? In short, it felt great to ride every day. Here’s what we loved about the whole experience. 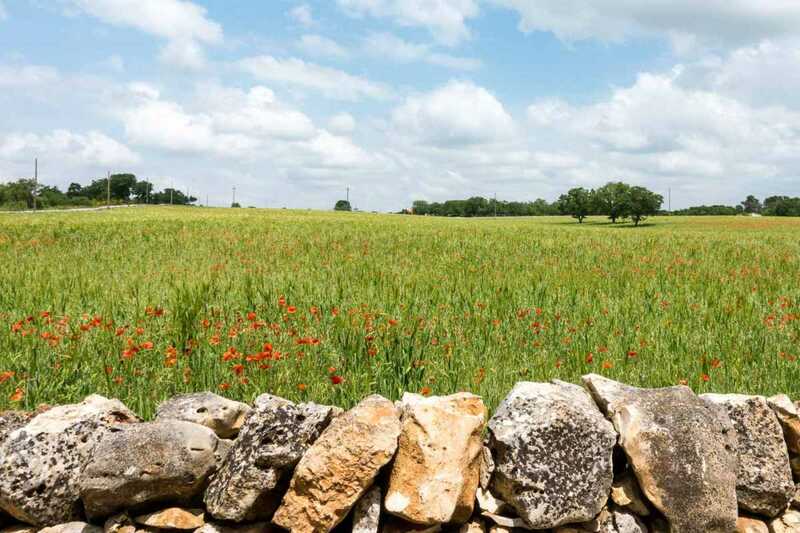 Rock walls and stone houses are the result of clearing the fields, many of which are dotted with red poppies. We were comfortable on our bikes and happy to be moving. With decent bike shorts, our own helmets, some sunscreen and water, and GPS, we were off each day without knowing precisely where we were going or what the weather would be. At first the idea of biking about 35 miles a day was daunting. But day by day it got easier. Soon, each 5, then 10, then 15 kilometer segment seemed just like a lap around the neighborhood. Every day it felt good to attack some hills, zoom down others, and pedal steadily across flats. Tom’s blood sugar dropped. Our muscles were just sore enough to measure our effort without for a second causing us to question the ride. I wasn’t really going to know how my knees would do until I started riding. Amazingly, considering my normal pain and gimpy walking, the cycling was not only pain free, it probably strengthened and helped me. Hurrah. It’s true that bike travel is primarily through scenic areas and at a pace slow enough to appreciate the sights and smells and local idiosyncrasies. Like walking the Camino de Santiago, there is time to examine the close-ups and occasion to take the long view. We stopped for shade and water, to look at fields of poppies, to estimate how far the hills and how near the thundering clouds. We wove through olive orchards, smelled fresh pine forests and pungent agricultural whiffs, and generally got to know Puglia from the inside out–from the farmlands to the coast, from the countryside to the cities. 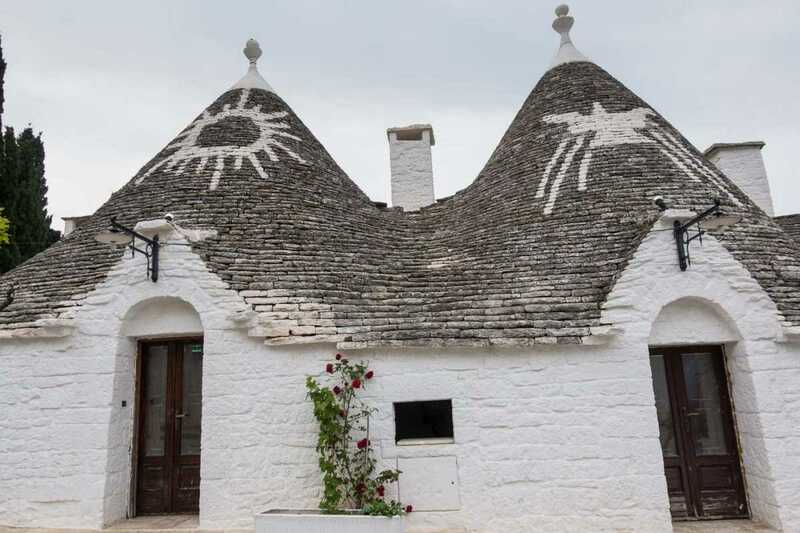 We really appreciated being able to see, for example, the renowned trulli–the conical shaped stone homes and farm buildings–in their rural settings, being used in both traditional and modern ways. These beautiful structures are not confined to the World Heritage Site in Alberobello as you might think, but are scattered around the countryside where we biked. 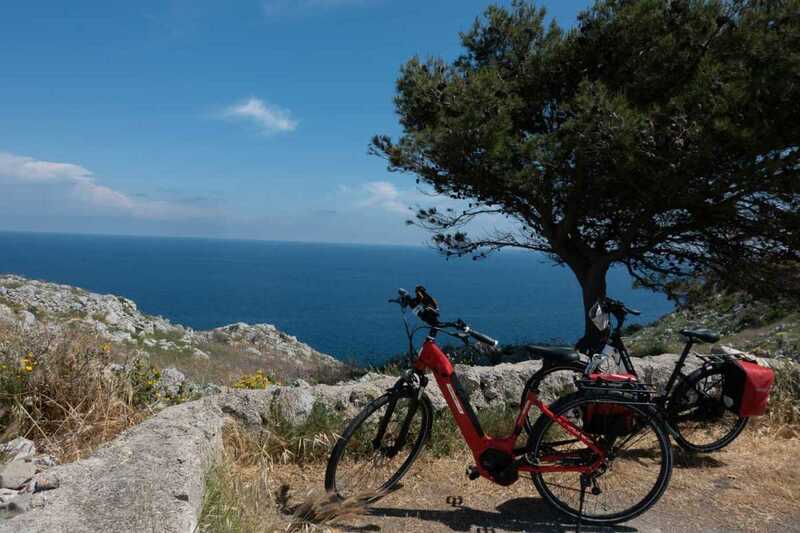 Admiring our e-bikes and the scenery, too, on the way to Otranto, Adriatic coast. We were reluctant to choose e-bikes. It seemed like a cop-out or admitting defeat. But for various reasons we made the choice, and it was a good one. Once on the tour, we kept counting the ways we appreciated the extra boost. Turning on the electric assist is like having your parent push you a little as you get going on your bike: a little extra distance for the pedal action, but still every rotation is needed. We quickly learned, with a bit of instruction on day one, that it’s even fine to get going from a stop with a little power. That’s especially true if you are starting uphill, or in town when swerving out into the street might be a bad idea. Uphill, of course, especially when the incline increases toward the end of the climb. Into a wind, not to mention uphill and into a wind. On a one lane street through town, when traffic must follow behind. To speed through an unpleasant highway section. To get going when the bike, or your legs, feel like lead. Although e-bikes are heavier than regular bikes (the removable battery itself weighs around 5-6 pounds) and can therefore be tough to pedal up hills, the assist counters the weight factor. I learned (or relearned) to use the bike’s full range of gears per normal, just calling on the assist when the pushing got tough. The first day I used even the lightest assist sparingly, afraid I’d drain the battery and be left fighting to get through the last miles. By day three (it’s like crack, I guess) I was thinking, ‘If gear 2 is difficult, just use gear 3!” Because pedaling is still required, the guilt level wasn’t bad at all. A typical country road is designated a bike path, but also handles local traffic. We never got far off track except that one time I led us down a 10% grade and then realized, oops, wrong turn. We used our iPhone Google maps and our iPhone compasses a couple times to verify destinations. Also, Tom brought along his iPhone bike mount and used his Strava app to track our actual route and distances. We saw a few other bikers, most cycling, as we were, in pairs and on self-guided itineraries. A few expert cyclists passed us by, and we happily bypassed a larger group. 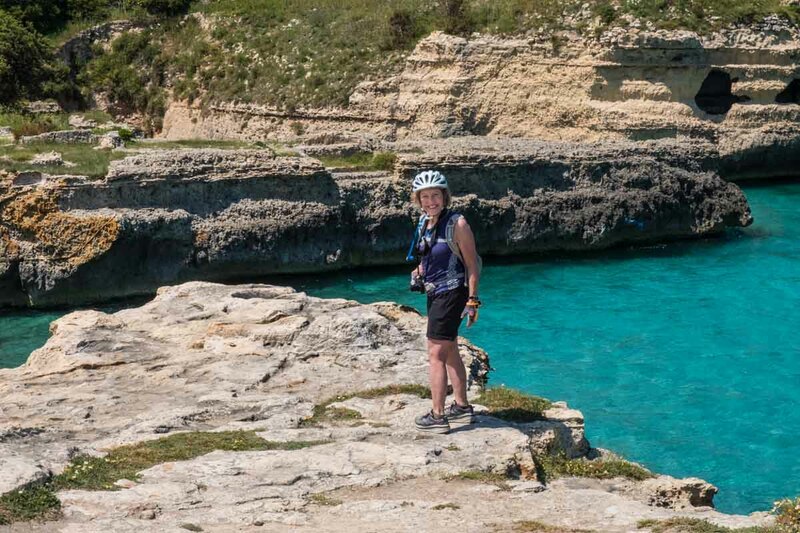 We learned near the end of our ride that a great route might be to follow the coast from Gallipoli to Otranto by way of Leuca, all around the edge of the heel of the boot. (We cut across.) Maybe next time! We got to Matera a day early, though still ended up returning for more sightseeing. 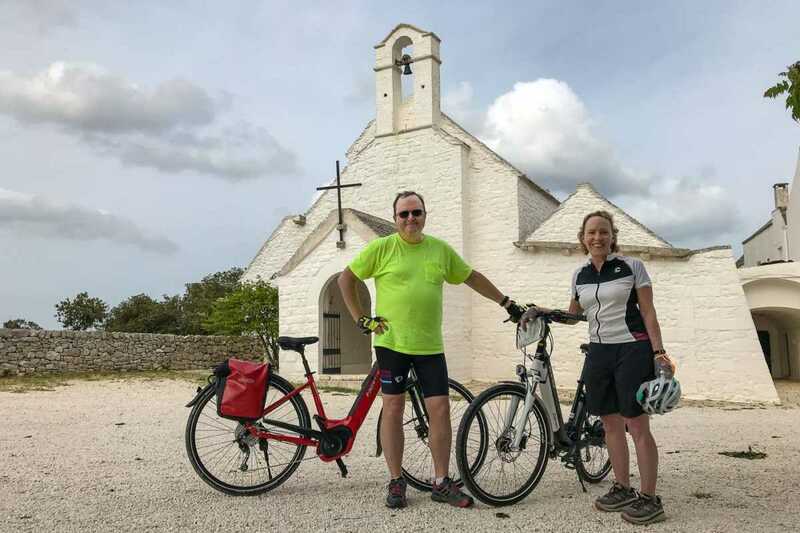 We chose this bike tour in part so that we could visit two of the 53 UNESCO World Heritage sites in Italy. 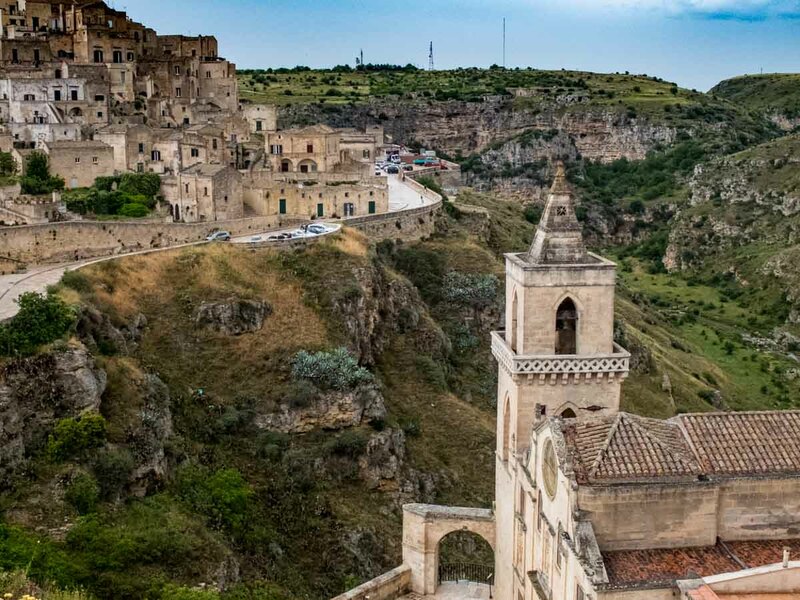 Matera, our starting point in Basilicata and home to the Sassi caves, is so fascinating we returned for another visit after the ride. Alberobello with its trulli homes is also worth a visit, especially if you can stay in a trullo as we did and avoid the tourist bus rush. We enjoyed lots of historic towns along the way, like Francavilla Fontana where we stopped for coffee. 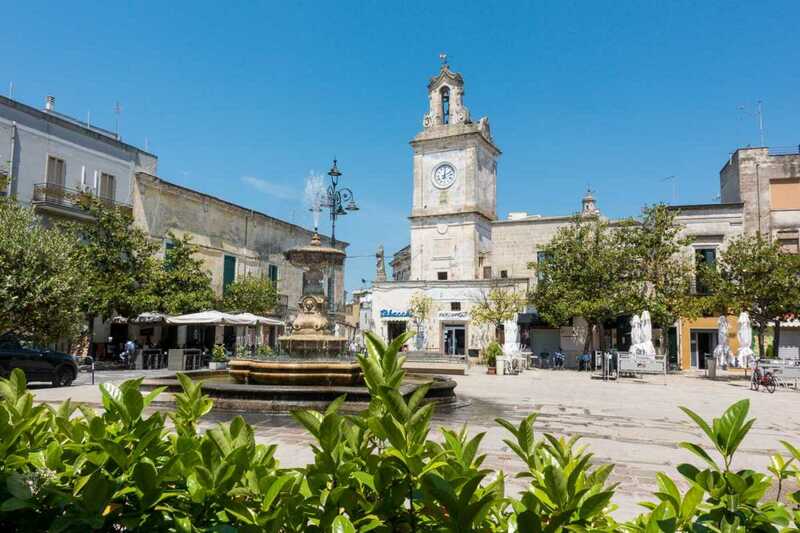 Being the history buffs we are, we also got a kick out of the 16th Century Torres di Nardo, various walled cities, stone streets older than my country, and the historic port cities of Gallipoli and Otranto. We did our usual walkabouts in Ostuni and Lecce, down many tiny streets, with stops in churches, castles, and interesting doorways. Our ride, from May 3 through May 11, was at a wonderful time of year for us. It was not too hot (in fact, Puglia was experiencing cooler than average temps) and it was before the heavier summer tourist season. We got sprinkled on a couple times, but the spring weather systems move by quickly. Tourists were primarily northern European, many of whom winter in Puglia along the coasts. 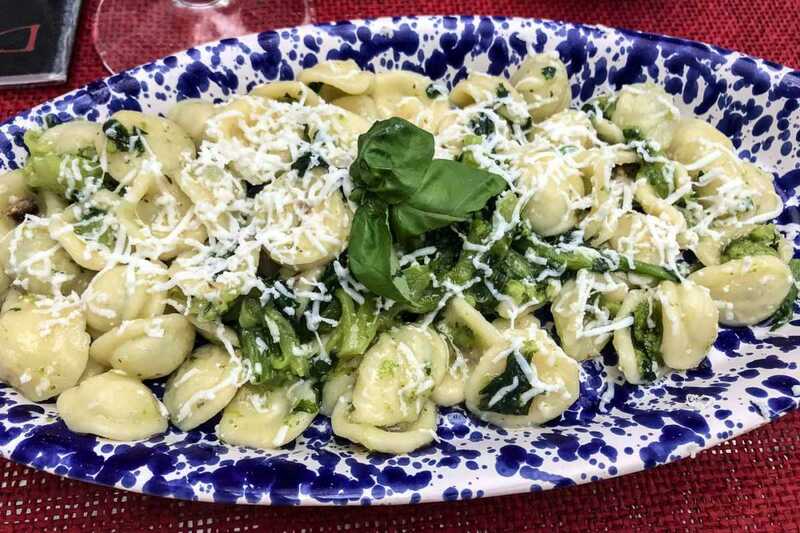 Typical of the region: Orecchiette con le cime di rapa. Fresh made “little ears” pasta. The pesto is alternately translated as turnip greens, chickory, or a type of broccoli. Starting in Matera a couple days before our ride, I figured the least I could do was a little carbo loading for the week. It didn’t stop there. Throughout we were treated to wonderful local dishes, and it was through these restaurant visits we came to understand the land we were biking through a little bit better. Cheeses, sausages, seafood, fresh vegetables, extraordinary olive oil, Primitivo wines. More details to follow in another post. OMG, this makes the whole tour so easy. It would be a completely different and more difficult experience if we’d had full and heavy panniers weighing us down. As it was, we left our bags at hotel reception in the morning, and they were delivered to our rooms by the time we arrived at our destination. All we carried were cameras, water, and an extra layer. The luxury of this trip was that the hotel rooms were planned and booked for us–AND that they were all really nice accommodations. A lovely property with pool and gardens, and about a 10 minute walk to the Sassi cave neighborhood. Our deluxe room with brick vaulted ceiling opened onto a large terrace. The staff was really helpful with our bikes, breakfast, directions and recommendations. Our suite was an entire trullo, with kitchen, loft, bedroom and living/dining area. If you want to stay in a trullo, check out this company. They have more than a dozen distinct trulli available, each named after the original owners. Ours was “Francesco.” Book early. Right in the old town between the main piazza and the cathedral, this hotel connects adjacent palace properties. When we arrived in the antechamber to get to our room, I literally thought I was in the wrong place, and had arrived in someone’s private living quarters. Large room; antiques and interesting decor throughout. Again, my expectations were exceeded! All I knew was that we were staying in a “farmhouse” one night. This masseria–an agricultural property open to guests–was far more than a bed and breakfast. It’s a country estate producing olive oils and wine, and is set up for guests with a large pool, outdoor bar and terrace, beautiful dining room, and capacity for large weddings or other events. Our room with thick stone walls was cool, if a bit damp, but it accessed a terrace overlooking acres of orchards. Beautiful. Do check out this and other masseria properties–centers of agri-tourism and fine dining–when traveling in Puglia. Just one block off the main street, this modern hotel offered the best idea I’ve seen in a while: a motion-activated ventilation fan in the bathroom. Genius. Ours was a nice 2-room corner suite, great for two people trying to air out and relax and recharge everything. The location is about a 15-minute walk to the old town of Gallipoli (which is actually an island at the tip of the peninsula). After walking through the old town, we really enjoyed a late dinner at a recommended restaurant near the hotel: Trattoria La Stazione. One of the larger hotels we stayed in, Corte di Netunno seems to be part museum! The owner has collected ship and seafaring paraphernalia for decades, creating a fitting exhibit for this historic port city. (Don’t miss the pipe collection in the hall behind the elevators.) 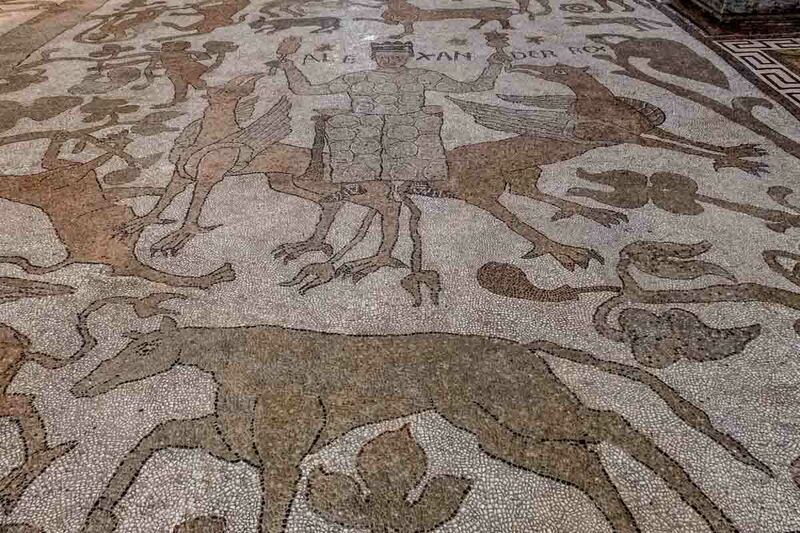 The hotel steered us to the best sight in this somewhat obscure town: the mosaic floor of the basilica. This is a beautiful boutique hotel owned by an architect whose design touches are visible throughout. We luxuriated in our two-room suite with terrace, and enjoyed the breakfast/lounge area with a really good playlist. This quiet, out-of-the-way street is only about four blocks to the old town, a great place to celebrate the end of the ride. Gallipoli to Otranto: over the heel and through the olive orchards. Some olive trees in this area are centuries old. Of course there were a couple grumbles along the way, that you, dear reader, should be aware of. Inevitably, the days began and ended in towns. Heavy traffic, more confusion using GPS, tight spaces, cars parked on sidewalks, drivers who love backing into traffic and nosing into parallel parking spots, impatient and inconsiderate drivers: all this made for some white-knuckle maneuvering. My favorite city shenanigans were in the town of Avetrana where a semi truck containing half a circus ride was a) lost and b) trying to bend around a small corner. We evaded that to find another truck whose crew was unloading sheets of glass. Right out of a Laurel and Hardy movie. When in doubt, get off your bike and walk until things clear up. Tom claimed the last time Italians worked on their roads was to build the Appian Way. Watch for pot holes, washed out shoulders, loose sand, and detours. At detours, note that whenever possible you should ride through the construction zone (perfectly acceptable) rather than try to find the detour. Yes, traveling by bike is a wonderful exercise in slow travel. But staying just one night in each town means there is very little time to see the sights and attractions. That’s easy to fix: allow time before and/or after your ride to spend more time in the cities. Alternately, you could get an earlier start each day than we did, and arrive at your destination in time for lunch. (We rarely got going before 10 a.m.) Of course, your tour can be customized. That’s what Biketours.com and their partners like to do. Stay two nights in each city, or plan extended stays in a couple places. Do what you want: that’s another advantage of the self-guided tour. Our last scenic stop: Grotta di Poesia in Roca Vecchia. Thanks again to Biketours.com and to all the hotels, and to our tour operator based in Matera. On our last day, a pesky battery problem on my bike (it wasn’t taking a charge) resulted in a dead battery. I probably could have pedaled that beast into Lecce, but instead we made the call and enjoyed a beer and one more scenic overlook (Grotta di Poesia pictured above) before getting a lift the last 30 kilometers into town. We loved Puglia so much we ended up staying an extra five nights. Our next post will fill you in on more of the places we visited during our ride and during our “overtime” visit. If you’re thinking of doing a tour like this one, or just doing some longer distance cycling, you might want to check this post for some advice on our favorite cycling gear that will make things a little bit easier and more fun. That’s a part of Italy we haven’t explored and you’ve reactivated the travel bug even as I sit here preparing another blog post about our recent trip to Italy. Great post and I like hearing the good as well as the grumbles! What a marvellous post! Puglia has been a part of Italy that has eluded me so far. But I’d love to go there as they host a Euro Chocolate Fest every fall. Thanks for your great pics. It has motivated me to plan a trip. What a great story. I never learned how to ride a bike so this was a great vicarious experience. There were really no negatives. Going into towns each night I would welcome. And the short city stays were designed into the tour. Congrats! What a interesting trip.I don’t know if I could manage the biking (particularly uphill), but it sounds wonderful. As I read the article I wondered about luggage. Then I got to that part. having it taken care of for you certainly makes the trip more manageable. I also like the option of staying an extra day in a couple of spots along the way to explore more. David and I often bike when we travel. We do it independently by either flying our bikes with us or buying cheap bikes when we arrive. We love the freedom to watch the scenery that you get when going at bicycle speed but organising everything ourselves is a real hassle. Maybe I will look at a ‘tour’ for our next trip. 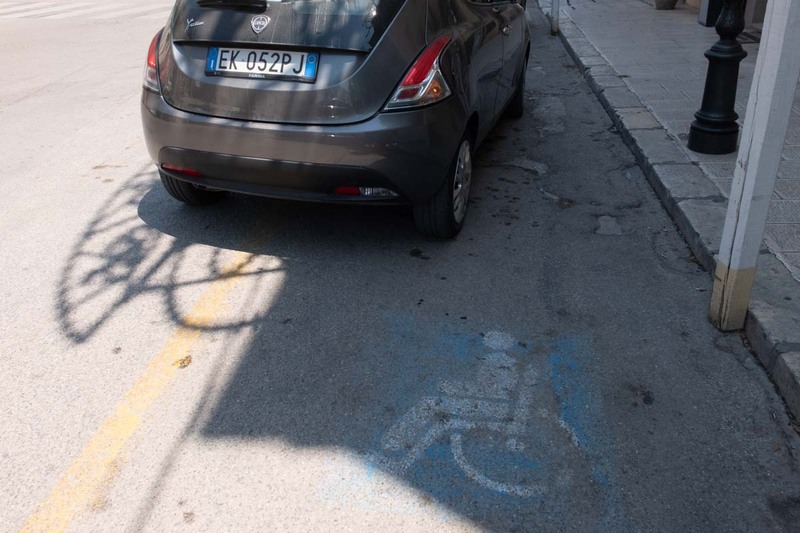 Puglia is definitely on my list to visit and I love the idea of the electric-assist bikes. Brilliant! Luggage transfers would make it manageable for a wobbly cyclist like me. Looked like it was a fun experience. Would love to do a bike trip in Europe but it would definitely have to be with electric assist and on relatively flat terraine-too out of shape these days for anything else. 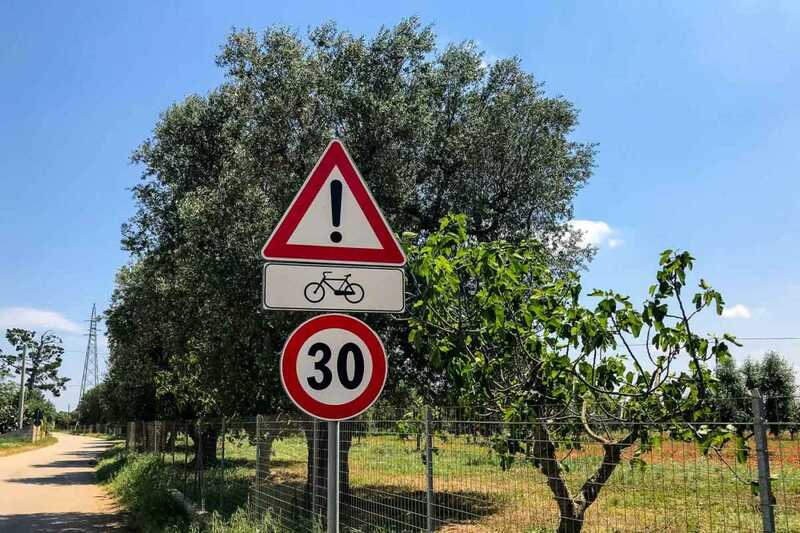 I’m dying to visit this part of Italy and although I always thought a bike tour would be too far out of my comfort zone, I’m rethinking this adventure based on your post. thanks for the honestly about the city traffic and maneuvering. I think that would be my biggest challenge as well. Really complete coverage, I look forward to reading more about the food! I’ve spent quite a bit of time in Puglia but never visited Avetrana — on the list now as well as a stay at Masseria Bosco. I love the masserie of Puglia. Really nice to read your blog! I´m starting to plan a solo cycling tour in Puglia, starting next month (very spontaneous, I know). Thanks for sharing your trip and tips.